Profesor Gabriel (r) with Prof. Schwarz of the Humboldt Foundation. ISR-affiliated Professor Steven Gabriel (ME) recently participated in two notable international academic events. Gabriel, who was granted a Humboldt Research Award from the Alexander von Humboldt Foundation in 2014, participated in the 44th Symposium for Humboldt Research Award winners held in Bamberg, Germany in March. 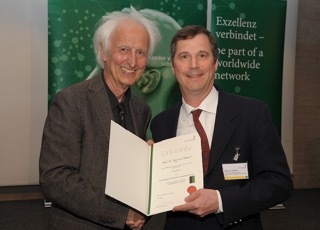 The award recognizes a limited number of researchers throughout the world on topics that are noteworthy, and the award winners spend part of their time in Germany to pursue their intended research. Gabriel works with the DIW, the Deutsches Institut für Wirtschaftsforschung Berlin (aka the German Economic Research Institute). There, he is developing discretely constrained equilibrium problems (e.g., Nash-Cournot models) with applications in energy, transportation, and other areas. Gabriel will continue this work through 2016 and beyond. Gabriel also was an expert discussant for the Energy Information Administration’s Global Hydrocarbon Supply Modeling Project Workshop, held at the Center for Strategic & International Studies in Washington, D.C. in early April. The topic was scenario planning in energy to better understand likely and extreme events in that sector of the economy. The event was attended by a number of industry experts from the Department of Energy, academia, and industry.